Now over 15 years old and still using the original cache container, this classic cache is back in action! The cache is situated in a little suburban bushland with a very interesting and large feature, you'll certainly know it when you get there. There may be some scrambling involved depending on how you attack the cache, so that is what the 4 terrain rating is for. The 4 for difficulty is because finding some waypoints may be not be easy, you have been warned. There is a marked bike track and a nice abseiling practice spot there for those who want to have a bit more fun. To make it a bit more challenging we won't be giving any clues, so just make sure you come prepared for all caching possibilities. However, there is no need to do anything dangerous, so don't go climbing any guard rails etc, keep Geokids and Geopets under close supervision. This cache may not be possible 1 out of every 100 years, lets hope it's not this year. The cache may not be easy or safe to do after heavy rain. Gbyq lbh jr jrera'g tbvat gb tvir lbh nal pyhrf! 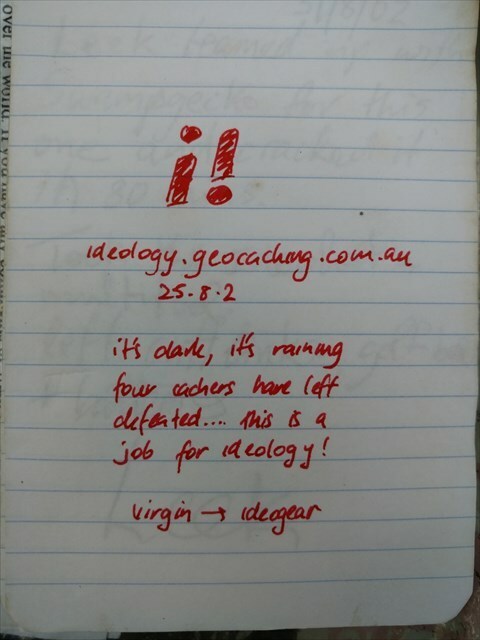 First FinderPhoto log of the first finder, the (in)famous Ideology! In August 2002, this cache is now 15 years old!